Vallabhacharya (1479–1531 CE), also known as Vallabha, was a Telugu philosopher who founded the Krishna-centered Pushti sect of Vaishnavism in the Braj region of India, and the philosophy of Shuddha advaita (Pure Nondualism). Vallabha was born in a Telugu family that had been living in Varanasi, who escaped to the Champaran of Chhattisgarh state while expecting Vallabha, during the turbulent times of Hindu-Muslim conflicts in the late 15th century. Vallabha studied the Vedas and the Upanishads as a child, then travelled throughout the Indian subcontinent over 20 years. He became one of the important leaders of the devotional Bhakti movement. The hagiographies written by his followers, just like those for other Bhakti leaders, claim that he won many philosophical debates against the followers of Ramanuja, Madhvacharya and others, had visions and miracles. ^ Beck, Guy L (2005). "Krishna as Loving Husband of God". 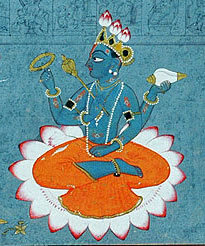 Alternative Krishnas: Regional and Vernacular Variations on a Hindu Deity. SUNY Press. ISBN 978-0-7914-6415-1. Retrieved 12 April 2008.